Do you want to ensure your next build is realized in a timely, precise and manageable fashion? Traditional models for design, planning and realisation like floor plans, axonometric and section drawings are limited in the amount and types of data they can contain. The dispersal of your data between models and the necessity for multiple plans leaves vital details of your project open to varying interpretations and misunderstandings. Due to their static nature, they are also ill-suited to the fluid nature of modern build processes and can lead to imprecise time, cost and material estimates. Suir Engineering can help you relieve these concerns via cutting-edge computer modelling, intelligence gathering and integration, allowing you to realize your entire project’s lifecycle in virtual form before you break ground. Our in house Digital Modelling capability enables us to bring engineering excellence to every project through intelligent design and smart technology. Core to this is 3D and Building Information Modelling (BIM). By utilising software packages such as Revit, Plant 3D, FabCAD, MEP, Vectorworks, Vault and Navisworks, our experienced integrated BIM team works with our clients to add efficiency and productivity in design to their building lifecycle. BIM combines advanced mock-ups of physical structures with a wealth of intelligence about each detail of the model, from large scale architectural features to individual infrastructure elements, enabling clear and painless coordination between architects, designers, technicians and contractors. Customisable BIM models serve as excellent presentation material, allowing you to consult and involve everyone from investors to end-users in your design and construction process. By virtualising a real-time build of your project, we can help you identify incompatibilities or miscalculations that might have only otherwise manifested during the construction process. This not only allows for more precise construction sequencing but helps you arrive at a realistic date of completion. Through 4D modelling, you can simulate critical stages of your build to identify and mitigate risks before they manifest. These capabilities are also extremely valuable for helping new workers orient themselves and to brief them on potential hazards. BIM also allows us to point-to-point prefabricate mechanical and electrical scope, as well as precisely plan for the delivery of materials, reducing the need for on-site stockpiling. 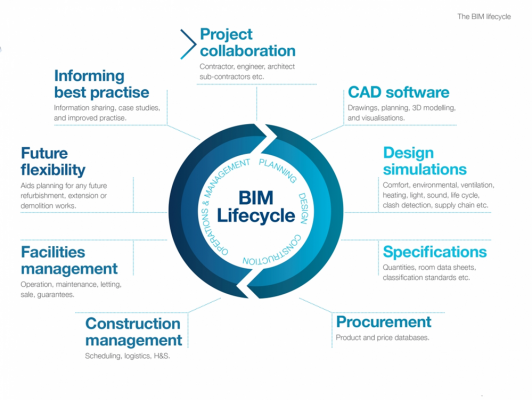 The value of BIM modelling extends well beyond the construction phase however: the detailed information built into the model can assist you in forecasting the lifespan of individual components in order to schedule and budget for replacement and retrofitting long in advance. Similar advantages apply during expansions, repairs or conversions. Through the integration of real time information, we can help you create a BIM model that grows with your business. Get in touch with our design team today to see how BIM can streamline your next build and deliver outstanding value and results for your investment.